As usual, some attractions just don’t work as well with kids. 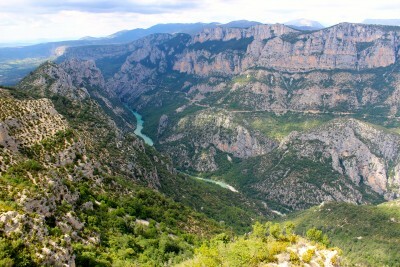 Gorges du Verdon is no exception. 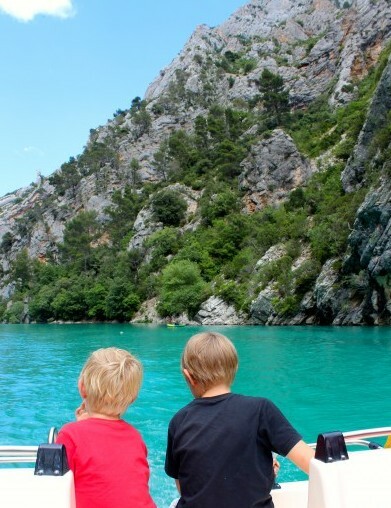 But follow our tips and you will have a wonderful family day exploring the Gorges Du Verdon with kids, with no whinging! Look on any review site and you will see the Gorges Du Verdon rated 5/5 and as a ‘must see’ in France. They are sometimes compared with the Grand Canyon and people spend several days exploring the gorges. I always take reviews from people without kids with a grain of salt as really, what works on a holiday without kids is usually quite a bit different to when you are holidaying with kids. 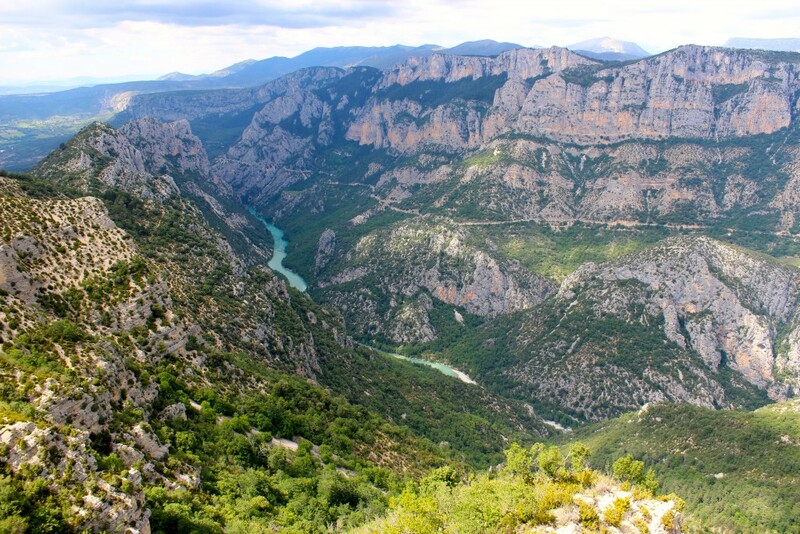 The Verdon Gorge is narrow and deep, with depths of 250 to 700 metres and widths of 6 to 100 at the river level and 200 to 1500 metres from one side of the Gorge to the other at the summit. The Gorges are located in the midst of the region of Provence, Alps and the French Riviera, and two hours away from Marseilles or the French Riviera. They sound like a reasonable day trip when you hear it like that don’t they? Oh good, you think, we’ll jump in the car, drive the two hours there, take a look around and then return. This is the case if you don’t have kids, if you do have kids, you need to be aware that to see a large part of the gorges you need to drive many, many kilometres of windy and high roads that will take you at the very least half a day and maybe even a day if you stop lots. I don’t know about you, but my kids don’t much like a whole day in the car and the whinging kicks in after about 3-4 hours and the ipad batteries go flat after about 7 hours! 🙂 So, is it worth doing the Gorges with the family? Absolutely, but you need to do it a bit differently. Lake Sainte Croix is the key to enjoying the gorges with kids. A massive 10km long lake that is the result of a dam created in the 1970s and which leads into the gorges. The colour of the lake is beyond belief – an amazing blue hue. From here you can canoe or pedalboat (or even electric boat) up the gorges for about 2km or you can play on the rocky shores of the lake. 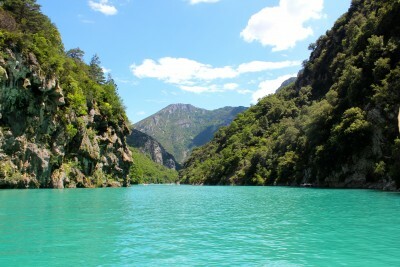 For my money, I would come to the shores of the lake near the village of Les Salles-sur-Verdon and spend the day on the lake and exploring the gorges within a maximum of 20km from there. 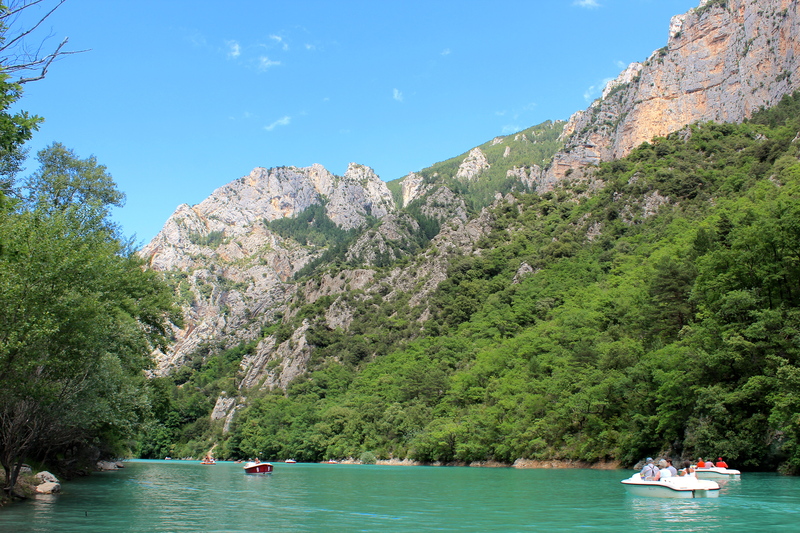 We decided on a pedalboat, a very reasonable €15 per hour and we took 2 hours, which was more than enough time to very slowly and enjoyable meander our way up the gorges and back. It is very easy to pedal the boats but if you are worried, then take an electric boat, no effort required! The boats are great in that they have little ladders on the back and so the kids were leaping off and jumping in the water and climbing back up again. Up to 4 people can go on board – I guess you would have to take 2 boats if you were a family of 5 or more. Lifejackets were provided for the kids and they really enjoyed sitting on the back dragging their feet in the water and spotting fish and picking up bits of bark and leaves. We stopped a couple of times and they played in the rocks on the shore. Yes there are lots of people doing the same thing, it is a touristy spot, but you can see why. The contrast between the water and the gorges is so beautiful. The crowds didn’t bother us, the gorges and the lake are big enough for everyone and it is nowhere near as crowded as the beaches on the French Riviera! So this was a 5/5 stars for us. The kids (9 and 5) loved it, as did we! It was one of those times when I simply could not stop taking photographs! The gorges reach high into the sky all around you and the colours in the rocks are vivid and alive and even more so against the blue of the water and green of the trees. You go past a lovely waterfall on the way, and can even go under it if you feel brave enough! We should have taken a picnic and eaten it on the lakeside and let the kids play there all afternoon. But we hadn’t brought lunch with us and so we headed to the nearby village of Les Salles-sur-Verdon which provided a great history lesson for the kids. At the time of building the dam in 1973, the old village of Les Salles-sur-Verdon, which would be flooded by the dam, was evacuated by force and destroyed, to the great displeasure of its inhabitants, many of whom families had been living there for centuries! A new village was built higher up the valley and is now the youngest village in France. Over a very tasty lunch at a cafe (tasty even despite the very rude service from the waitress), we told the kids the story of the village and talked about how we would feel if that happened to our home and village. They were shocked and felt sorry for the poor villagers. My five year old suggested that this was perhaps the reason that the waitress was so rude and cranky, she was still angry about the village?! How I love 5 year old logic sometimes! 5 minutes down the road and the nearby village of Moustiers Sainte Marie is very picturesque and worth a look and walk around. If you then want to explore the gorges more, without embarking on the half day circular route, I have a good tip to let you see a little more but without signing up for hours in the car with grumpy kids. 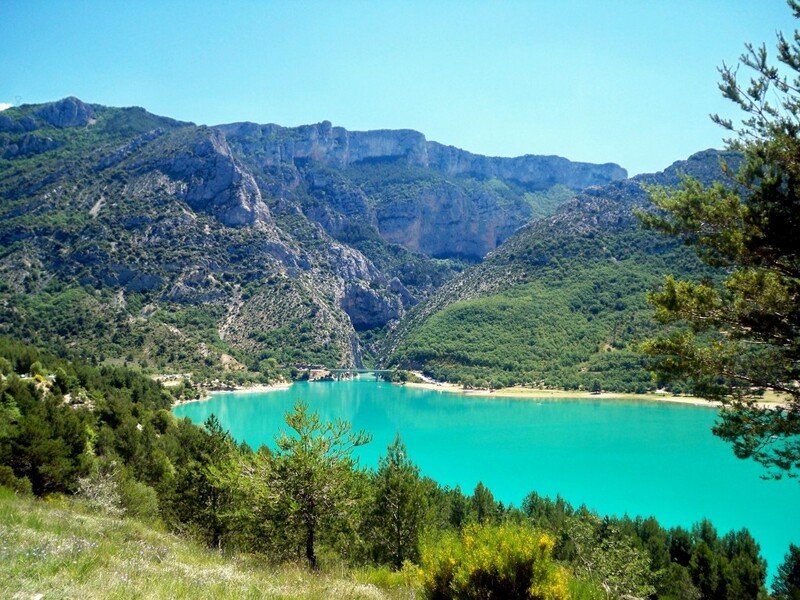 Leave from Les Salles-sur-Verdon and head about 6km towards the the village of Aiguines, a lovely village perched high up on the hill which has great views of the lake and a few cafes and restaurants. Take a look around, grab an icrecream and then drive about another 10km along the D71 to see the gorges. You will be rewarded with sweeping views of the gorges where you have canoed already and with the vastness of the gorges. And once you have been your 10km (or 15km if the kids aren’t whinging), TURN AROUND and head back to the Lake and spend the rest of your day there! Do not get stuck on the gorges road as it goes for hours and we had very grumpy kids at the end of our day! 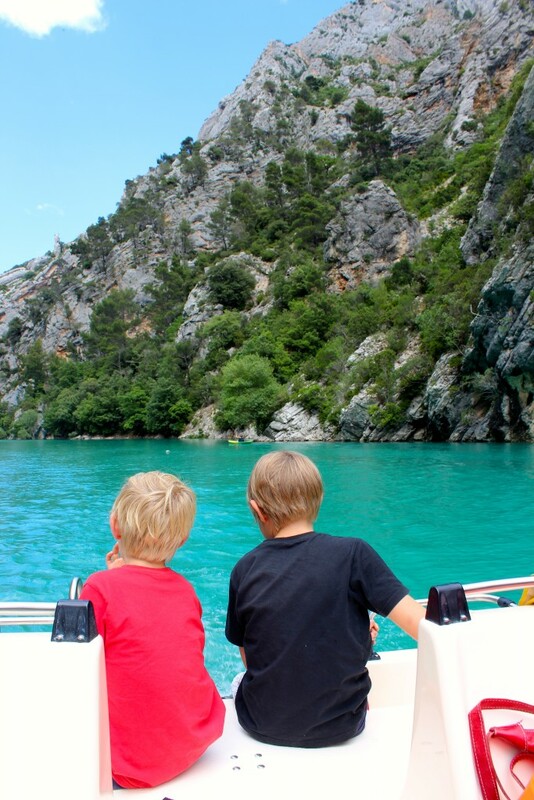 Have you been to the Gorges du Verdon or Lac Saint Croix with kids? Let us know what you thought by writing a review.